…this wunnerful merry-go-round called authorship is the proverbial gift that just keeps on giving for this ol’ Jurassic Scots scribbler… I’m not afraid to try new stuff on the Web, but I must confess, much of my intrepidity is curtailed by my infinite lack of knowledge about how it all really WURKS on here… I’ve said before, when I switch on my Mac and it lights up, I do a lap of honour… that aside, the most recent novelty has been my venture into Audio Book publishing... not that I went to search it out… quite the reverse in fact… I received a message a coupla months back from a terrific guy called Chris C. Hogan, who is a professional voice artiste and narrator, inviting me to consider delving into the Audible maze… for any of my fellow-penspersons who are intimidated by the thought of having listeners as well readers, I can highly recommend Master Hogan to be alongside yeez as yeez dip yer quilly toes into these hitherto uncharted waters… he did all the grunt WURK, figuratively and vocally… it was painless for me… he did the actual recording, and the coordination with the Audible folks… and presto, hey… THE VIOLIN MAN’S LEGACY is now downloadable in Audio Book… as some of yeez may know, THE VIOLIN MAN’S LEGACY was my first Jack Calder crime thriller, five novels ago, punched out nearly ten years back (and still getting gratifying downloads on the Auntie Amazon Kindle eBook medium), so we started with that to test the appetite… and bingo!… it’s doing okay, thank you, nurse… Chris has done it with a gravelly, Southern English accent, which fits perfectly with the darker theme of the action… the overtone of menace is there when needed… (after all, I do have more than a sprinkling of bad guys in there)… if yeez want a wee sample to hear what I’m talking about… correction – to hear what Chris is talking about… click on the link below and enjoy… see yeez later… LUV YEEZ! 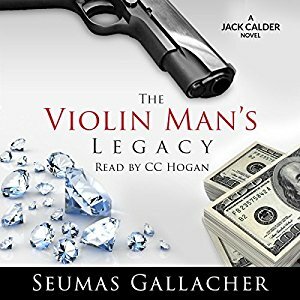 Seumas, congratulations on the new audio book. May it go well for you. I reblogged to my blog. Sounds good Seumas. I have been chatting to my daughter recently about the benefits of audible. She cleans her apartment while listening to books. Apparently it makes the cleaning much more pleasant! My eldest is a total bookworm and keen writer and like her mum hates cleaning! Perhaps this is the way to make cleaning more desirable. LOL. When I was growing up, we didn’t have a dish-washing machine, so of course that meant there’d be no postprandial relaxation for us children until the washing-up was done. We made that despicable task go by faster by our reading aloud to the one whose turn it was to get dishpan hands. Lol. Yeah with you 100%! I love it! Listening to the clip reminded me how much I enjoyed reading your book. Congratulations! May the audio version help you to continue to grow your fanbase! …Theatre of the Mind’… LUV that, m’Lady, Suzanne … I might steal it soon! Thanks for all the advice over the years and the books that you signed for my parents on my behalf. I e-published my first book The Hartnetts at the end of July last year. I have started writing another novel this morning and I am currently editing some others.